New Delhi: The President of India, Shri Pranab Mukherjee inaugurated an international conference on the theme of “Universities of the Future: Knowledge, Innovation and Responsibility” at O. P. Jindal Global University (JGU), Sonipat, Haryana today (March 18, 2017). The three-day Conference seeks to examine the future of Indian universities in the 21st century. Speaking on the occasion, the President said that he was happy to be present at the Conference. He complimented the O.P. Jindal Global University for emphasising on research, development, and innovation as its basic objective from the very beginning. He said that in his capacity as Visitor to central institutions of higher learning, he has been repeatedly stressing on the need to improve the standards of higher education. 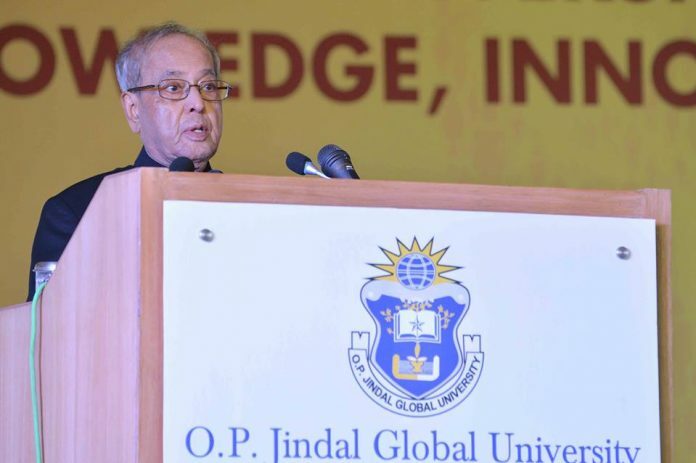 The President said that the requirement of today’s educational system is to focus on innovation and research. India’s education system will have to take on the challenge of tapping its ‘demographic dividend’. We will also have to provide a competent skilled workforce. Interface between education and industry should be established. Another important necessity of modern Universities is to have a chain of inspired teachers who can ignite the minds of students and encourage them to think out of the box. Young boys and girls should be encouraged to have problem-solving minds to enable them to solve problems through their ingenuity. He said that since 2014, the Festival of Innovations [FOIN] is being held in Rashtrapati Bhavan. He has seen in FOIN how a large number of persons from obscure places and remote villages have tried to solve the problems of society through innovation. However, at the same time, it was also essential to establish linkages between innovation and the market. He emphasised that future Universities must establish strong linkages with various stakeholders in society. Unless we have strong foundations of basic research, our futuristic University plans will be seriously jeopardised.